Update, January 25: Subnautica’s developers are speaking about adding an arctic biome in future expansions. Unknown Worlds Entertainment’s Charlie Cleveland spoke with Rock, Paper, Shotgun just before Subnautica’s 1.0 release January 23 and discussed some tentative plans for the game now that it’s out of Early Access. 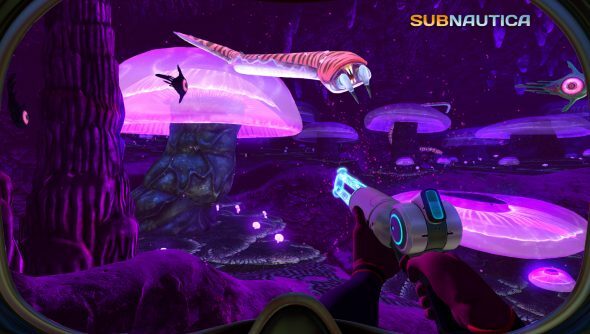 Find out how Subnautica’s community helped make its underwater world so exciting to explore. One possibility is the addition of an arctic biome, which is an idea that’s been kicking around on the studio’s public roadmap for Subnautica for some time. However, plans for future content aren’t at all solid yet, and Cleveland indicated the team wants to see how version 1.0 performs financially before committing to any plans for DLC, which they’re “80-90 percent sure” they’re going to do at some point in the form of paid expansions. Right now he says the team is focused more on making sure the game is working smoothly. Should additional content be in the works, it almost certainly will not include multiplayer or modding support. “We made the game we wanted to make with Subnautica,” Cleveland told RPS. Original story, January 10: Subnautica has an official release date. A countdown timer on developer Unknown Worlds Entertainment’s website has revealed when the Early Access survival game’s 1.0 launch livestream will go live. At the time of writing, that countdown is at 13 days and just under 14 hours. Meaning the livestream will begin at 02:15 GMT on Wednesday January 24 (18:15 on Tuesday January 23 PST). According to Unknown Worlds, the stream will include the premiere of the Subnautica cinematic trailer, interviews with developers, and the live pushing of ‘The Big Red Launch Button’. There’ll also be “real-life sea creatures,” apparently, but their role in proceedings isn’t exactly clear. The underwater Early Access survival game has been in ongoing development since December 2014, and had initially suggested a late 2017 release date. Since that 2014 date, however, the developers claim it has been entirely playable, and over the past three years the game has received an update every five to eight weeks, on average. You can watch the full stream on the Subnautica Twitch channel, but if you can’t make it, the whole broadcast will be posted to the YouTube channel straight away. Unknown Worlds say Subnautica’s price will probably rise slightly after it leaves Early Access, so if you want to pick it up at the discounted price, head over to its Steam page.